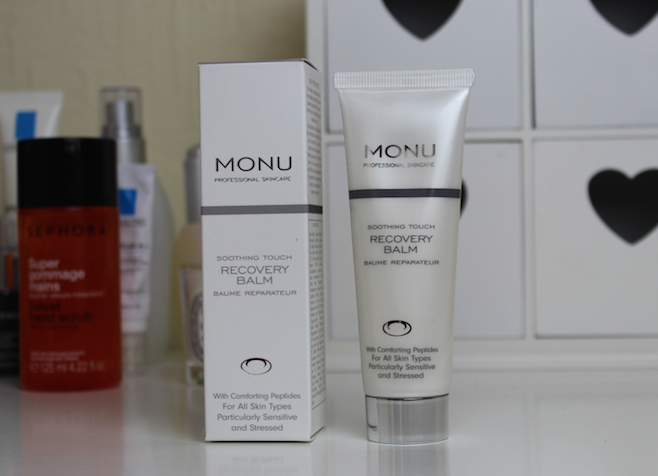 Monu is a professional skincare brand used by beauty therapists worldwide. Their products contain pure, natural ingredients from plants, herbs, minerals and essential oils. None of their products contain damaging chemicals, artificial perfumes or synthetic colours and they don't test on animals either. After hearing all of this, I was excited to be offered a product for review on my blog as I love trying new products by brands I haven't experimented with before. I described my skin as dehydrated with sensitivtity and I was sent the Recovery Balm*, a gentle balm to provide immediate relief to all skin types, especially sensitive or stressed. Looking at the back of the tube, you can see so many amazing ingredients; soft rose and bergamot oils, peptides to relieve irritation and reduce inflammation, evening primrose and blackcurrant seed oils to repair skin lipids, shea butter and sodium hyaluronate to improve the skin's barrier function, natural betaines to stimulate the skin's hydration process and plant flavonoids with antioxidant action to prevent premature ageing. I tend to use this as a moisturiser after cleansing and toning or as a night treatment before bed. The product has a creamy texture but it's not thick or greasy. When you rub it into the skin it almost melts in and absorbs really fast. It feels immediately soothing and leaves the skin feeling very soft with no shine. I love the herbal scent of this product too. I've really been enjoying using this product and it's a great one to use after a day in the sun to help soothe your skin. I'm also looking forward to using this product as we get into the colder months again as I think it will be great for skin that has been wind-battered and dehydrated from central heating! This product is available from the Monu website here for £22.50. What products do you like to use on sensitive or dehydrated skin? I've never tried a cleansing balm before but this seems like it would be great for my dehydrated skin, especially as a precaution for the coming winter months. Sounds fantastic! I have dehydrated skin too, so might give it a go!